Centuries ago, the Black Death shadowed the world, claiming the lives of tens of millions. Now the world is on the brink of another scourge—and this time, it will be an extinction-level event. . . . 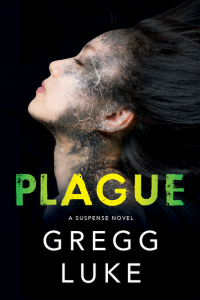 Professor Mitch Pine knows all too well the history of epidemics, so the startling new information he’s discovered has him racing to the Centers for Disease Control in Atlanta. Mitch has uncovered a startling pattern: dramatic environmental changes always occurred prior to devastating outbreaks, and current climate change may be such a catalyst. But before his plane lands, Mitch’s journey takes a terrifying turn. He is intercepted by a woman who represents a dangerous faction whose interest in Mitch’s research opposes his mission to save lives. To secure Mitch’s cooperation, his research assistant is being held hostage. With so many lives on the line, Mitch embarks on a turbulent trip around the world, uncovering pieces of the puzzle until he ultimately holds the key to prevent—or precipitate—global devastation. Unless he can find a way to stop the lunatics behind his abduction, a plaque the likes of which the world has never known will be unleashed. I like to be a little scared when I know that I’m safe at home. I love the way this author makes his books so suspenseful. The reader never knows what will be coming next. And it’s just so well done! I loved everything about one! I loved the way the characters are in this one. Mitch is great. And the way he’s basically kidnapped is so crazy. I can’t even imagine that kind of thing happening in real life. I liked that in this one, the reader sees through several characters point of view. You see through the “kidnapper” Kiana’s eyes as well. I thought it was kind of interesting the way she saw things. And the way Mitch was able to interpret what she said and draw conclusions from the things she said. She kind of told him things about her without ever saying the words. And eventually he puts it all together. The last of the characters that the readers can see the story through is Suko. Suko is Mitch’s research assistant who is kidnapped. So many crazy things happen to her. I loved the way she keeps her poise. She knows how to deliver some great lines, even under duress. That was something I loved about her character. And she fought back for as long as she could. I loved the way the reader learns along with Mitch what the crazy madman wants him to learn on his around the world trip. This one is great! If you want to be a bit scared, but not too scared, it’s a great one to read! I was sent a copy of Plague as a gift from the publisher. All opinions are my own. Gregg Luke was born in Bakersfield, California, but spent the majority of his childhood and young adult life in Santa Barbara, California. He served an LDS mission to Wisconsin then pursued his education in biological sciences at SBCC, UCSBB, BYU, and subsequently graduated from the University of Utah College of Pharmacy. His biggest loves are family reading, writing, music, science, and nature.